For those of you with problems getting to or viewing the poster, I'll try to retype the verbiage. 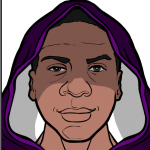 And mega THANKS to Hammerknight both for the great idea, and for running it, he IS the man! 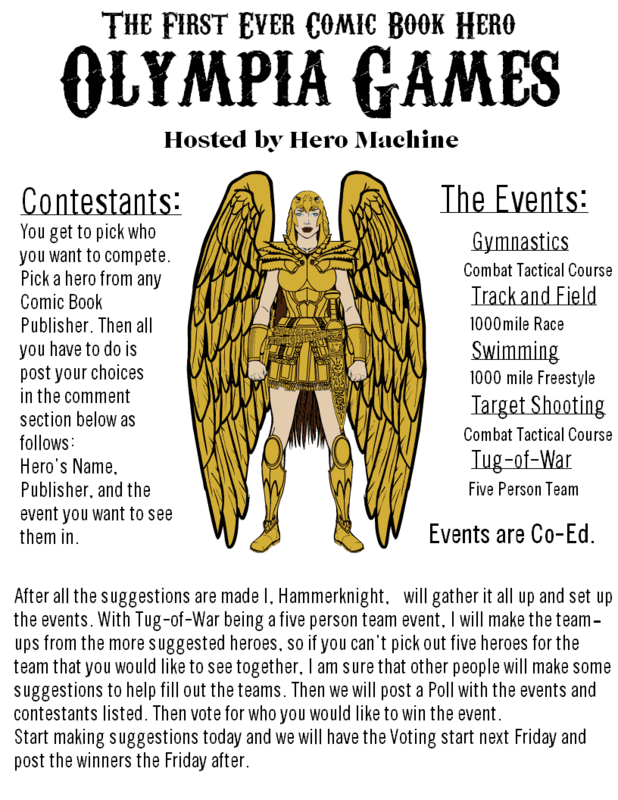 The First Ever Comic Book Hero OLYMPIA GAMES! You get to pick who you want to compete. Pick a hero from any Comic Book Publisher. Then all you have to do is post your choices in the comment section below as follows: Hero's Name, Publisher, and the event you want to see them in. After all the suggestions are made I, Hammerknight, will gather it all up and set up the events. With Tug-of-War being a five person team event, I will make the team-ups from the more suggested heroes, so if you can't pick out five heroes for the team that you would like to see together, I am sure that other people will make some suggestions to help fill out the teams. Then we will post a Poll with the events and contestants listed. Then vote for who you would like to win the event. Start making suggestions today and we will have the Voting start next Friday and post the winners the Friday after. That’s right, I have Galactus playing tug-of-war. Beat that. First off, all great suggestions. Second it will be taking place in lets say a Olympic Universe that the Gods have created for the games, so there for any powers the hero has will work like it does in their own universe. Third, The publishers are like a country, ie, USA, Japan,England, etc. So that means Marvel will be playing against DC, and any other publisher to see how many gold medals they can win. 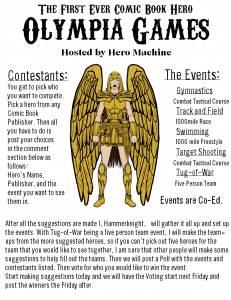 So for the Tug-of-War you can pick the complete team or just make suggests of who you would like to compete in it. You can make as many suggestion as you want to. Help bring in ideas from other publishers then just DC and Marvel. It would be nice to see about four or more competing. Their can also be more then one from the same universe competing in the same event just like the real Olympics. Also remember these are Heroes that believe in fair play so they hurt someone just to win. One thing I did forget to put, Heroes can be living or dead. The gods have gathered them up to play the games. All heroes will be at the peak to level the playing field. So if there is more the one person that has been that hero write down which one you want to see compete. Sorry about the add ones here I should of remembered to include everything but I didn’t. This is the first ever so any suggestion that all of you have for the games are welcome. I do believe that a blind vote would be better so that it will be more of a surprise when the winner is announced. Jeff, since everyone’s putting in villians, can I make a new list? Don’t ask me, ask HK, it’s his show. Isia and I were just talking. Because a couple of Villains were suggested, should we include Villains or should it be Heroes only? And if we do include Villains should we have each universe have a Hero and a Villain team. Example “DC”-Heroes and “DC”- Villains, “Marvel”- Heroes and “Marvel”- Villains.? @Superfan, if the (th Wonders is a comic book publisher then they can be used. Everyone keep making suggestions, I’m keeping track of them and writing down how many times a hero gets suggested and that way if I have to narrow it down I will go with the ones that have the most suggestions. Well, here’s more suggestions since 9th wonders is applicable. I’m new to writing comments so hi Everybody! I think we should be able to put in villians. It would make it better. and if Oz is excluded from Tug-of-War they’ll only have four men at the ropes and Luffy D. Monkey as the fifth man trying to convince Boogey and Woogey to pull in the same direction. Oh! I just thought of another change! Replace Deadshot with Sniper from Yu Yu Hakusho, Shueisha Comics. It is looking great so far. Remember don’t limit yourself to just one choice let me know who you would like to see. I think it’s going to be a very good game with all the suggestions so far. DC, Marvel, Dark Horse, Fawcett, Shueisha, Image, and 9th Wonder. Does anyone what to suggest more publisher(which I’m using instead of countries)? Does anyone have anything to say about the ones we have so far? Let me know because I’m going to try and do a rough draft within the next day or so. So Let me know who you want to compete. Thanks Gero. All and any help is welcome. Okay now we have some Vertigo people, lets see if we can get some more to compete in the other events. Just typed up the Gymnastics event for Friday. We Have Seven publishers for the event. DC, Marvel,Fawcett, Dark Horse, Image,9th Wonder, and Shueisha. I didn’t come up with anyone from Vertigo for this event. There is still time to be heard for the other events.